I had a fun “bunch” aboard this morning for some cool water white bass fishing. Grandpa Phil D. of Georgetown brought his two grandsons, Riley and Jacob out. Phil’s intent for the boys was for them to catch a mess of white bass and have fun doing it; his intent for Phil was to get better at sonar interpretation by picking my brain on use of the Lowrance HDS-10 with Structure Scan I’ve got on board which works in very much the way his HDS-7 does. We were able to meet all expectations by trip’s end. 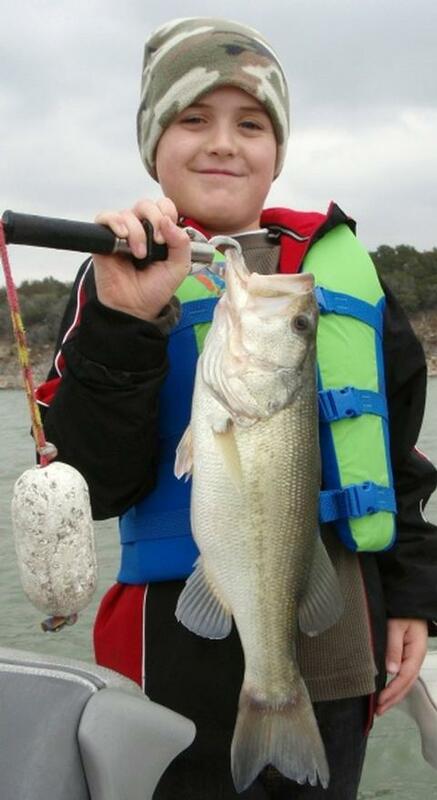 Jacob B. of Salado proudly holds the big fish of the trip. Jacob (R) and Riley (L) stayed very consistent with their technique and very attentive to the often light-biting fish to put together a respectable stringer today. As we got going this morning, the skies were still pretty murky, dark, and grey following sunrise, so, we stayed in shallow water for a while both flatline trolling and observing, mainly for bird activity. We picked up our first fish (Jacob broke the ice) on a flatlined Wiggle Wart — an 11 inch white bass — just on the W. side of Area 999. I didn’t see enough action to make me want to stick around here, so we packed up and headed to deep water. One thing we did have going for us was the wind going S. 13 before the sun even rose, and staying at that speed for nearly the entire trip. We did some looking over some deep flats and did spot some fish with sonar in the vicinity of Area 549/702. As I often do with beginners, we began with heavier than ideal slabs so that the boys could appreciate key sensations which are amplified when using a heavy bait such as 1) the lure falling, 2) the lure striking bottom, 3) the lure fluttering back to bottom during jigging, and 4) the lure stopping at the end of the jigging stoke. Both boys quickly got the hang of things and we put fish after fish in the boat for 3 solid hours. As is often necessary this time of year once a bite goes soft, we moved about the area where we’d initially contacted fish after the fish turned off a bit in order to exploit “pockets” of fish finding 3-8 fish or so each time we made a move. 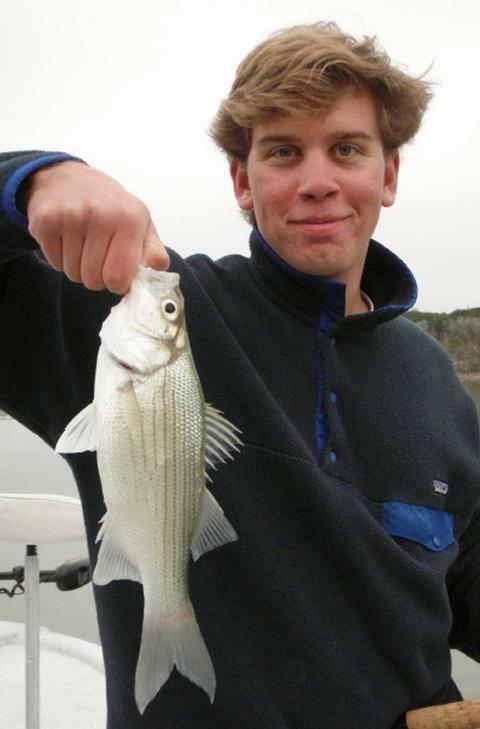 In all, by around 11:00am, we’d boated 54 fish, 100% of which were white bass. We decided to make one final move to Area 713 (BA: 6 HG, 4T) and found actively feeding white bass staying tight to the bottom in only 17 feet of water. We picked up 16 more fish here in about 35 minutes’ time, including an “eleventh hour” black bass boated by Jacob. As we headed in, I noticed Phil’s eyes were kind of red — that’s because he stared wide-eyed at the sonar without blinking for 4 1/2 hours straight!!! (Just kidding — kind of!). I always enjoy having youngsters aboard, and young men of Jacob and Riley’s age are my favorite — they’re eager (as most all kids are) AND they can do all that’s required technique-wise to do well (that’s typically not true for younger kids). Wind: Winds were S14 with occasional higher gusts. What beautiful weather this afternoon! A south wind, sunny skies and temps around 70 made it a great way to close out the year today. I fished today with C.W. of north Austin who grew up stream fishing for trout in Utah. Given this background, C.W. already handled a spinning rod real well which gave him a leg up on this trip. C.W. with a sampling of the 106 fish we took today. Eager learners always do best on my boat, and such was C.W. Given the sun’s intensity, we began our trip in deeper water and gradually moved to mid-depths. We were fortunate to locate fish very shortly after we began searching, finding abundant white bass schooled tightly on bottom in ~36 feet of water near Area 079. The fish got frenzied for a while as we first began fishing here, thus allowing for a smoking tactic to be used. That’s where the deprogramming came in … C.W. was used to setting the hook “on contact”, as is appropriate in most angling situations, however, in this scenario, simply allowing the rod to load as the fish grabs the lure results in infinitely more landed fish. Indeed, C.W. missed the first 4 fish that he reflexively set the hook on, and then settled in and landed fish steadily for the remainder of the afternoon after retraining his brain and muscles. Together, we boated 25 fish before the smoking retrieve no longer attracted strikes, after which we changed over to a jigging technique. We boated the majority of our fish — 79 to be exact — here, and then hopped here and there to boat the remainder of our 106 fish take. We had success at Areas 145, 697, and 698. At each area we found roughly the same scenario — fish present but sluggish, allowing a few fish to be caught right off the bat, then forcing us to really work for a few additional fish. It was clear that we’d experienced the majority of the afternoon’s “window of opportunity” on Area 079 as that afternoon feed ramped up, peaked, and dropped off. So, this marginal activity was to be expected, especially given the decreasing winds. By sunset, our count stood at 107 fish. I told C.W. we’d try one more area given how bright the skies were following sunset. As we idled into area 329, I saw suspended white bass on sonar. This was going to afford C.W. an opportunity to do a bit of “sniping”. As we hovered over the fish, I’d point out fish on the sonar, and C.W. would work his lure right to the fish trying to provoke a response. We took chances on about 8 fish, and, finally, got one to take the bait. The fish wasn’t anything to write home about, but there is a sense of satisfaction that comes when you’ve been successful using a technique that is new to you. C.W. and I both thank his lovely wife for getting him a fishing gift certificate for Christmas. This was a very enjoyable trip for me. I fancy myself a “teaching and coaching guide” and C.W. was a very teachable fellow and did well as a result of his willingness to learn. Wind: Winds were S11 at trip’s start and slowly tapered to S4 by trip’s end. This afternoon I welcomed aboard Mark L. and his son, Garrison, of Round Rock, accompanied by Chet “Gramps” G. of Ontario, Canada. Garrison hoists our trip lunker, a 4.75 pound, 20.75 inch largemouth that went for his 3/4 oz. TNT 180 slab from out of 26 feet of water. Mark, Garrison, and Chet — 3 generations finding something in common today! Mark and I spent a bit of time staring at the Wunderground weather website wondering if were were going to be able to get this trip in with the regularly changing forecast that was the norm since last Thursday, but, when all was said and done, we were blessed to have a stiff southerly breeze, and overcast skies pushing out a bit of windless drizzle and murk from the morning hours. We met at 1:15pm and were on top of a large school of white bass by 1:30, thanks to a trio of herring gulls that gave away the location of these fish. Fishing was pretty straightforward today — when we first arrived here at Area 329 the fish got excited as our slabs (TNT 180’s in 3/4 oz.) first appeared thus allowing us to use a smoking technique to catch a few. That enthusiasm waned pretty quickly, so a jigging technique was then more appropriate and accounted for the lion’s share of the 87 fish we boated on this trip. Living by the maxim, “Don’t leave fish to find fish” at least when I have guests aboard, we moved a few yards left, right, forward or backwards to stay in touch with active fish over nearly a 3 hour span. 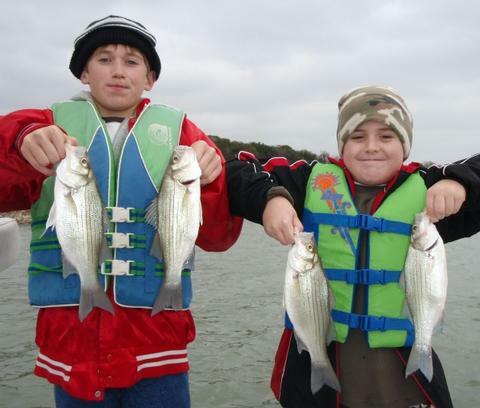 In all, we boated 79 fish from this area including 77 white bass of all sizes, up to 12.5 inches, and 2 largemouth bass, the largest of which tipped the scale at 4.75 pounds and 20.75 inches. By around 4:10 the action waned here so we moved on. We gave flatline trolling a try in 3 different areas and struck out at the first two, finally reconnecting with some white bass off to the E. side of Area 999. Here we put twin Wiggle Warts to work back far enough to get them to scuff bottom in 10-12 feet of water and ride just above bottom in 14 feet. This combination worked well and netted us our last 8 fish of the day — all white bass — in the 20 minutes before and 10 minutes following sunset. We finished up the day with 87 fish (85 white bass and 2 largemouth). Just for the record, at no point during the trip did Gramps say either “hoser” or “eh?”!! This afternoon I welcomed aboard father and son Hawaiians, Charlie and John B. who came to see grandma in Temple for a Christmas visit. As we traded e-mails before this trip, Charlie shared with me that the all time record low temperature for his hometown on Maui was 53F!! 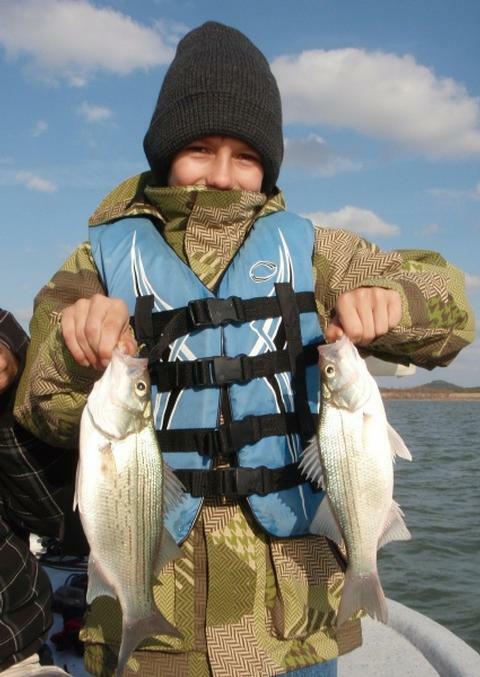 Tropical blood cools quickly in 40 degree weather, but this young Hawaiian had what it takes to boat Texas white bass in the winter!! Great job, John! As you might guess, the pair had to endure a bit of climactic shock to make this trip happen, but they were more than up to it — I was actually pretty impressed with 8-year old John’s “grit”. He kept a smile and good attitude the entire trip when I knew full well his hands were cold as we did what works best this time of year — and that is vertical jigging. After meeting at the boat ramp, we spent a few minutes getting acquainted and then shoved off. I never even got up on plane before we spotted sonar evidence of catchable fish on bottom in 24-28 feet of water (BA:3 HG) right at Area 033-530. I put the boat in a hover over these fish and we began pulling white bass right away. These fish were mainly 1-2 year old fish, going right at 10.5 inches or so, but, there were plenty of them there and they were in a willing mood, which is not a bad thing with novice “jiggers” on board, as both fellows got to experience the sensation of a strike, timing their hookset, and fighting and landing fish over and over again. 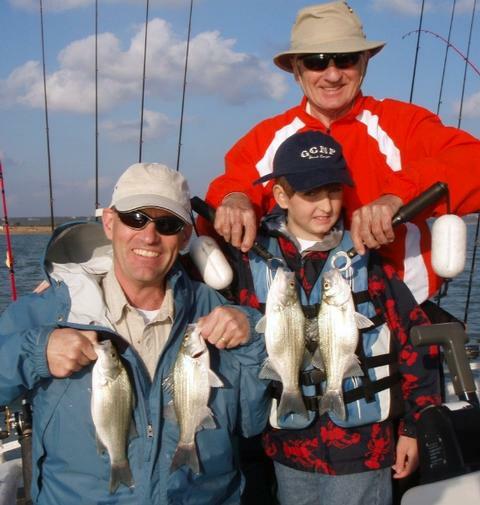 Often times smaller fish will strike a slab harder then larger fish because they lack the “vacuum power” that larger fish have, so, they must physically grab hold and shake, thus creating the distinct, rapid “peck-peck-peck” sensation that small white bass often produce. We did boat one crappie here, as well. Once the bite had died here, we took a look at a few other areas, finding more cooperative fish at Area 702. We caught fish here until about 4:20p when things got soft. 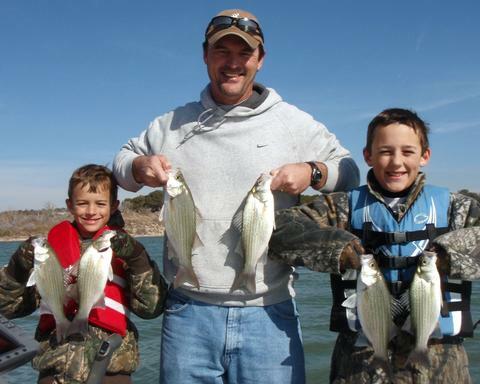 We caught a mixed bag of year classes here, but all white bass, with the larger fish coming right off the bat, and smaller fish being landed after that. At 4:20p, things really fell off quickly. We gave flatlining a try at the 319-703-114 “circuit”, but this only produced 3 hooked fish with 2 landed. I was a bit concerned when I began to see numbers of terns heading to roost well before sunset, but, in hindsight, that was a sign that the window of opportunity had closed on this day. We called it a day right at sundown with exactly 52 fish landed, including 5 fish that exceeded 13 inches. Our largest fish was boated by John and was one of the fish we caught on a Storm Wiggle Wart while we were flatlining. It went 13.5″ and weighed in at 1.25 pounds. After providing a few suggestions on some local eateries, John and Charlie headed out. No, they haven’t stocked Mahi-Mahi in Stillhouse, but if they did, I’ll bet little John would be toughing it out to catch one!! Wind: Winds were S10-14 with occasional higher gusts. Skies: Fair to partly cloudy. On a morning that saw a sunrise temperature of 30F and a heavily frosted courtesy dock which we had to “ski” down, the action heated up soon enough and we walked away with another 100+ fish day, making this the 6th “100+ fish” trip this month. Today I welcomed aboard “Grandpa” Russ (C) from southern California, his grandson, 10-year old Sidney (R), and Sidney’s dad, Lawrence (L), both from Belton. Grandpa got a fishing trip gift certificate for Christmas and decided to cash it in right away. I chose Stillhouse for this outing as the fish have been a bit more kid-friendly here in that they are nearly all tight to bottom and in large schools. Once you find such fish, you can typically stay with them for quite a while. We began our trip at 7:45 with a bit of flatline trolling over the Area 319-703-114 “circuit”. This bite was a bit softer than it has been of late, giving up only a handful of fish. I don’t know if the cold has pushed the bait deeper or if the 3/4 inch rain on Christmas Eve upset the balance of things, but, this bite was definitely off. Around 8:40, with the S. wind getting to the 8-9mph range, I headed out looking for some congregated deepwater fish. We looked over a few areas and found solid sonar readings at Area 549 (BA:4T). All four of us put slabs down over these fish and at first used a smoking technique to catch about of dozen of the most anxious “over achievers”, but then things settled down pretty quickly as they often do in cooler water, thus requiring a vertical jigging technique. Over the next 3 hours we continued to catch fish, at first on 3/4 oz. baits, then, as the bite began to soften, on 3/8 oz. baits fished with an intentionally lengthened pause. 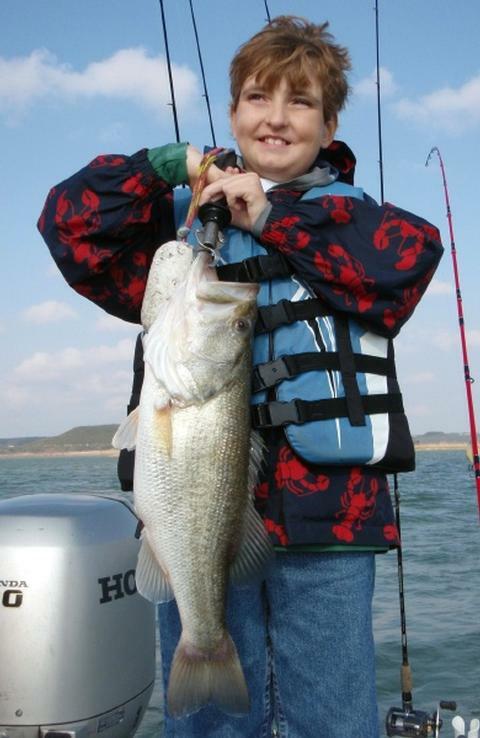 We caught fish in year groups from 1 to 4 years of ages, ranging from 8 to 13 inches. Of exactly 101 fish boated today, every last fish was a white bass — no bycatch of crappie, drum, or largemouth occurred. When all was said and done, Sidney and dad had all the fun, sun, and cold they could take for one day. Grandpa, on the other hand, I know would have been content to sit up on the front deck trying to match me fish for fish as we saw them come in low and slow on sonar. Alas, he had a flight to catch, so, we just had to send him back to do some more sunny California dreamin’ about the hot Texas fishing! Air Temp: 30F at trip’s start. This afternoon I fished a trip with brothers David and Sean F. of North Carolina; the young men are both in college there and are home visiting their parents who recently relocated from N. Carolina to Belton. I was a bit concerned about the weather, as the effects of E. winds are always unpredictable. David shows the best 2 culled from our first 58 fish caught vertical jigging. Sean, in the, ahem, only photo he would even grudgingly smile for, shows a nice white he bagged on a Cicada bladebait. The boys had some limited past experience and referred several times to a “family curse” which revolved around multiple instances of fishlessness even in circumstances when others immediately nearby seemed to have no such angling angst. We first headed to deep water while the light level was as great as it was going to get today. We ran sonar over a piece of bottom between and just north of Areas 638 and 640. There wasn’t much to see, but what there was looked right — I tossed a buoy, let down a “test” slab and came up with a healthy white bass in all of 8 seconds. I got the boys rigged up and provided some OJT as they refamiliarized themselves with the spinning gear I provided. 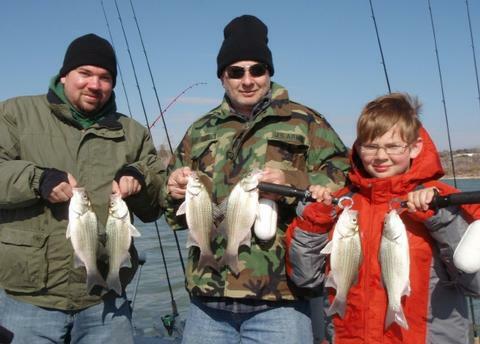 In no time both young men were consistently detecting and hooking fish — all white bass — in ~36 feet of water. Over a 2 hour span we moved less than 20 yards in any direction and boated exactly 58 fish, including 57 white bass and 1 drum. Eventually our E wind turned N and our N wind turned calm and that’s when our deepwater bite died. At this time we looked over one area for white bass and another area for channel catfish, but didn’t do anything at either locale. We moved on to Area 336 and at first attempted flatline trolling with Storm Wiggle Warts. We did well, boating 8 fish in about 20 minutes. Once a trend became noticeable concerning fish location, we backed off the “sweet spot” and saturated the area with casts using Cicadas. This put a final 5 fish in the boat including 4 white bass and a hybrid sunfish. The action died right at (obscured) sunset. Wind: Winds were E6, turning NNE4, then going calm, then picking up at NE7. I did not schedule any trips today due to the forecast for light winds. Although today was productive, the fish were both scattered and suspended so I had to work for every fish. I started off the morning at Area 710 (BA: 4T, 2HG) in 8-11 feet of water casting a bladebait. I put 3 whites and 2 barely keeper hybrid in the boat before the action quickly dried up and rematerialized a few yards away in 20-23 feet of water at Area 606. 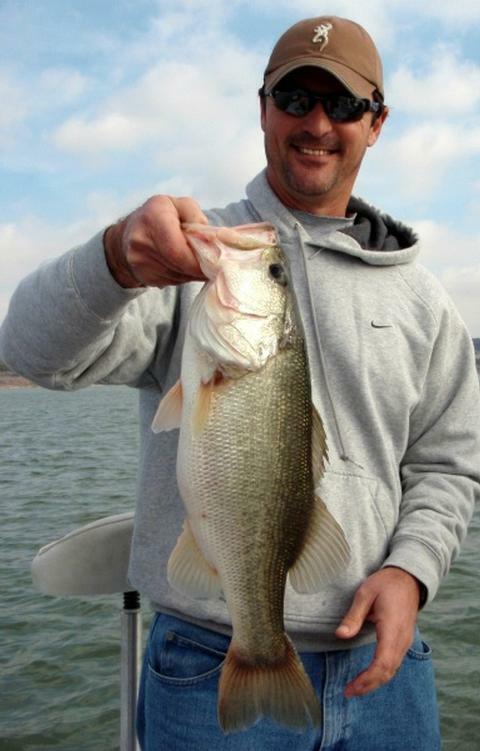 Here, a combination of lift-dropping, smoking, and jiggng put an additional 14 fish in the boat. The fish were active enough to take the 3/4 oz. TNT180, so I used it as long as they were willing. Next, I headed to Area 711 (BA: 7T) and boated 3 whites and 1 keeper hybrid in 14–16 feet of water on the large 3/4 oz. Cicada bladebait. Fellow guide Rick A. gave me a ring and let me know he’d found some white bass action near Area 708. I headed over and found active, but scattered and suspended white bass here from Area 708 over to Area 712 and all along the path between the two areas. A faster version of the “sniping” technique seemed to work best on these fish, over about an hour’s time I put an additional 28 fish in the boat, for a tally of 50 fish to this point. By 10:25 the fish and birds were just about done in this area. These picky fish preferred the 3/8 oz. slab. I headed to Area 686 and jigged for 18 more fish, all short whites coming out of 28-32 feet of water. These fish were lethargic and tight to the bottom. I took a lunchbreak and returned the water around 2:15pm. I began at Area 709 and found abundant, but still reluctant, white bass in 24-26 feet and jigged for these fish with a 3/8 oz. TNT180, picking up 31 fish here (29 whites, 1 largemouth, 1 drum). There was a bit of a hiatus for about 40 minutes as the wind went nearly slack, but, as it picked back up at 4:10, the fish got the most active that they would become this afternoon in this final stretch leading up to sunset. I headed to Area 694 and found abundant, but small, white bass and juvenile hybrid here in 22-24 feet of water. I boated 24 fish here in about 45 minutes’ time with the action ending at sunset. With no birds in sight at the section of lake I was at, I cranked up and decided to cruise in the post-sunset light to see if I could find any last minute bird action. I came upon ~7 terns feeding over 10-13 feet of water between Areas 565 and 663. I chose a smaller 1/2 oz. Cicada and fished it lift-drop style, boating a final 11 fish for the night including 9 white bass and 2 just-short hybrid. Skies: Light morning fog giving way to fair skies for the remainder of the day. This morning I welcomed aboard returning guests Ken S. of Belton, and his sons, Reid and Ryan. I’d had the opportunity to take Ken and his wife and boys out 2 summers ago in the midst of a strong topwater bite on Stillhouse where we fished topwaters followed by a bit of downrigging once the fish sounded. Now, in the cool months, the boys got to experience some entirely different techniques. Ryan (L), Ken (C), and Reid (R) with our six largest white bass of today’s trip. Most fish came on TNT180 slabs 3/4 oz. Ken lips our largest fish of the trip, a 4+ pound fish that struck his slab in around 28 feet of water. We started off the morning doing some flatline trolling in shallower water less than 17 feet deep hoping for some jumbo white bass up shallow given the grey cloud cover and winds keeping the sun at bay. In our first 70 minutes of effort we boated 12 white bass, all on Storm Wiggle Warts, and all in close proximity to Area 114. These would be the best quality fish of the trip — all stocky fish around 13.5 inches and all thick in the back and tail section. Once things began to slow a bit and the boys looked like they could go for a bit of variety, we headed out to open water to take advantage of the ~13mph wind that was blowing. As we looked things over, there were a few terns flying — searching, really — but they didn’t really help us locate fish. I searched over 2 areas and found fish at the second. We hovered over two areas and found solid fishing at the second. In about 28 feet of water we found a large, aggressive school of white bass including fish from at least 3 year classes in the vicinity of Area 103. We boated fish after fish here as the boys got more and more accustomed to the proper jigging technique and bite detection using both their eyes and sense of touch. The fishing went strong until around 10:35. After that we saw a slow taper off to nil by around 11:35. During this solid bite, we boated 110 additional white bass, as well as 2 largemouth and 1 drum. Most of our fish were taken via vertical jigging, although we used a lift-drop technique towards the end to try to draw in some fish from a little greater radius. The boys very quickly got the hand of the techniques I showed them AND stayed consistent in using them. When all was said and done we’d boated exactly 125 fish and the boys were worn out. The fish were done, the Dr. Pepper had all been consumed, the Pop-Tarts were all nibbled down to crumbs, and the sun was getting bright and warm, so, we called it a day, took a few photos and headed out. Air Temp: 58F at trip’s start. Skies: 100% grey skies turned gradually to fair and partly cloudy by trip’s end. After yesterday’s pre-frontal fishing, we saw a wind shift around 3:30 am with cold, dry winds then coming in from the NNW and eventually due N.
This 5 pound, 38″ longnose gar hit my slab and was located amidst a school of white bass. 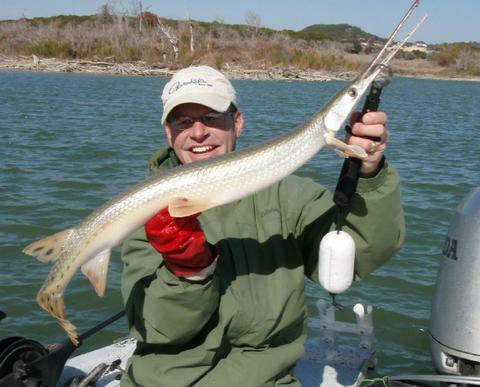 Through the year my clients and I hook many gar, but land very few. Gar have a long, bony snout with offering very little for a hook to grab hold of. This setup typically yields good fishing UNTIL the N. winds begin to die. This is an indicator that the pressure change associated with the front is nearly complete, and the pressure is now at or near its highest point and will remain that way until the high pressure system breaks down. Fishing then gets very difficult. This morning, we were ahead of the power curve and got on ’em early and stayed on ’em all morning and then some. I began by flatline trolling a circuit from Area 363 thru 703 and 316 over to 704. 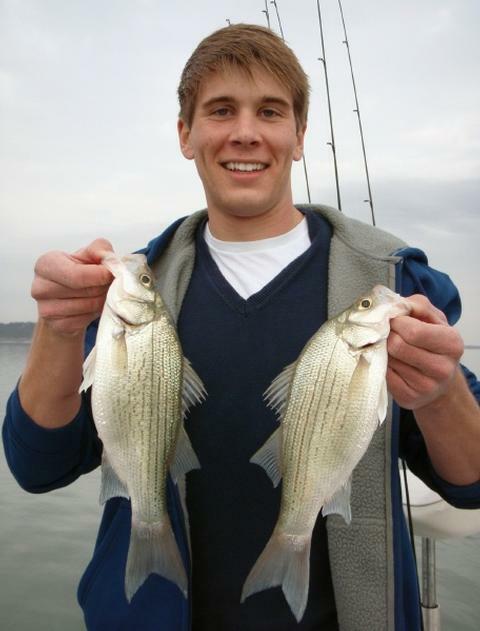 I experienced solid action over the entire route, boating 13 white bass in the first hour on the water. Next, some mid-depth action broke out in “Trough 707” (BA: 6HG) with lighter action over to the E and W at 705 and 706. Sonar showed abundant, bottom-hugging fish here in 16-21 feet of water. I worked them over with a slab and from 8:35 to 10:20, they were really jazzed — hitting a smoked slab, chasing hooked schoolmates, etc. After 10:20, things cooled down a bit and I had to work for every fish I caught from that point forward. I found during this time that an extended pause in my jigging stroke was effective. When all was said and done, I boated exactly 105 white bass and a 5 pound, 38 inch longnose gar. 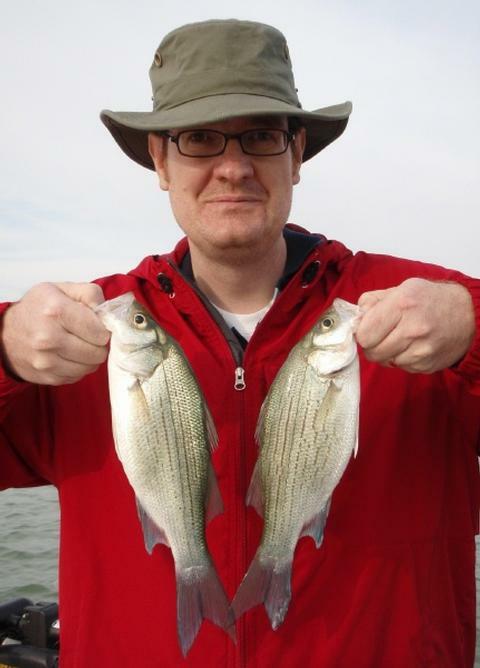 Of the white bass boated, only 3 were short (that is definitely NOT the norm!). A majority of the fish were right at 12.25 inches and very “stocky” looking with wide backs, convex bellies, and thick tail sections — just really healthy looking fish. Air Temp: 40F at trip’s start. Well, it doesn’t get anymore straightforward than this … I saw a pre-frontal weather pattern developing and knew the fishing would be great. I contacted 3 people who’d expressed interest in fishing in this winter season, and Colonel Ken C. of Harker Heights was the only one whose schedule would allow him to cash in. The Colonel, in typical Army fashion, worked half the day on post on this, one of his leave days, and then came directly to the dock from the office to squeeze in some fishing. 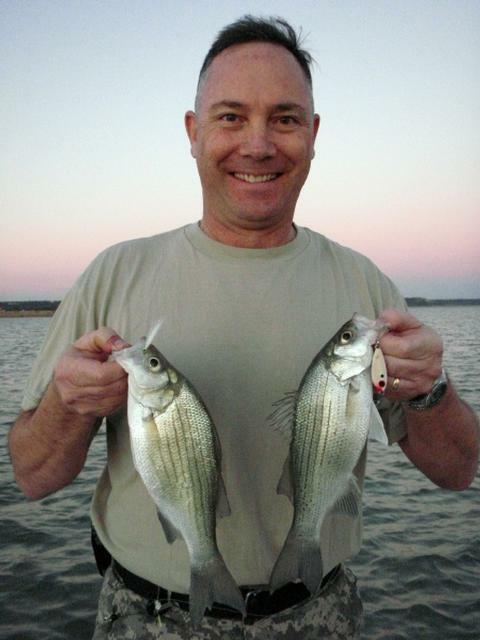 Here Ken shows a pair of clean, healthy Stillhouse white bass. We met at 2:20pm. At 2:40pm we found abundant fish in and around Area 679 at the transition between the deep flat here and the river channel. I dropped a buoy on these fish as a visual reference, and then set the i-Pilot on the Minn Kota Terrova to keep our nose into the 20-22 mph wind. That little puppy got a workout tonight and earned its keep!! On our first drop of the slab we came up with a double, and the fish never stopped coming in until around 5:10pm, just 10 minutes before sunset. Although the action ebbed and flowed and we occasionally needed to bump a few yards in one direction or another either along the break or up on the flat, we never lost contact with the fish. By 4:30pm we’d boated 85 fish and at that time, with the bite beginning to get soft, we made it our goal to boat 100 fish tonight and we did exactly that including 93 white bass up to 14.5 inches in length, 4 largemouth bass, 2 drum, and 1 crappie. Every single fish came on either a 3/8 or 3/4 oz. TNT 180 slab. At 5:10pm, with our 100th fish boated, we quickly headed to the vicinity of Area 033 to check on a sunset bite there, but none was to be had so we wrapped it up. Wind: Winds were SSW20, tapering off to SSW13.